BBQ Grill Mat – Don’t Let Your Food Fall Through The Cracks! This grillin’ season- don’t let your food fall through the cracks! It’s American’s favorite way to cook and gives food a delicious flavor that you can’t get any other way. Look into almost any American’s back yard and you will find a grill. A grill and a man or woman proudly grilling for their family and friends. 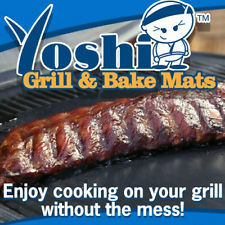 The BBQ Grill Mat makes grilling even easier. You get that great grilled flavor but you don’t lose your food in the cracks. Happens to us here at As Seen on TV Web Store all the time and to most of you out there. It’s frustrating and cost us money- something we definitely do not like. BBQ Grill Mats is the solution. These thin, non-stick mats can go right on your grill and you can cook your food right on the mat. The non-stick mats are super easy to clean- simply rinse with warm soapy water. Then roll up or lay flat for easy storage.